Miss E. is a young adult coming of age novel written by Brian Herberger. Elizabeth was fifteen years old when her family moved to Forestville, California, a sleepy little town several hours north of San Francisco. While rural and isolated, it was a big difference from the places where they had lived before, especially Texas and Kansas. Bets’ dad was in the army, so moving was no big deal for her. Bets packed light and was fairly adept at getting to know new places. While her mom had explained that the early July move was designed to help her get acquainted with the town and make some friends before school started, Bets knew better. It was 1967 and her dad was going to Vietnam. He was a gifted mechanic who maintained the army's planes and trucks, so he wouldn't be in as much danger as many other dads in the service would be. But Bets still couldn't wrap her mind around the thought that he'd be gone. She and her mom were totally different in temperament, while she could read so much in every little shrug or movement her dad made. Summer started pretty well. She quickly made three good friends and was looking forward to her first year in high school, but each day that passed meant his departure day was drawing closer. Brian Herberger's young adult coming of age novel, Miss E., is a modern-day classic set in the tumultuous 1960s. The reader's guide to this era in history is a most perceptive young woman whose army family background has left her a bit more grown up and experienced than many other kids her age. I loved watching her interact with her father and experiencing vicariously their easy and close relationship. And I marveled as he produced for her, almost as a magician would pull a rabbit out of his hat, a brand new bike and the chance at a part-time delivery job at the local market to make the trauma of his leaving a bit easier for her. From that point on, one can see Bets begin to blossom and thrive. She even gets to see that mysterious old lady, Miss E., whose trips into town in her ancient truck are the subject of universal awe and curiosity. Witnessing the most unlikely friendship of Bets and Miss E. develop was a joy, as was reading about Bets' freshman year in high school, where her world view is challenged and expanded by one very special teacher. I'm quite familiar with Forestville and the countryside surrounding it, and felt so much at home reading this book. 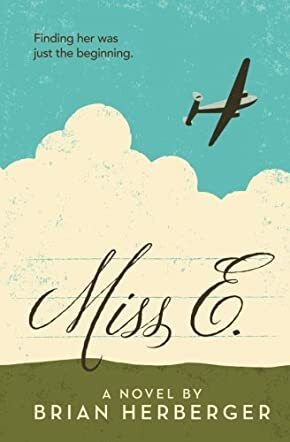 Miss E. is beautifully written, and the plot is brilliant. Herberger's historical background is spot on as his main character and her peers confront the reality of the conflict in Vietnam and the toll it takes on the families of those serving. This is an extraordinarily fine coming of age tale that held me enthralled and engaged until I finished the final page. Miss E. is a remarkable debut novel, and it's most highly recommended.